So, today me, Dusty, and Dusty's friend Kenny went whitewater rafting on the Arkansas River near Buena Vista (through Brown Canyon, specifically). Despite the fact I was feeling somewhat less than enthusiastic about spending essentially a whole day when I still really needed to catch up on stuff (like, say, email) after the long, long time spent living with the kidney stone (although physically I'm pretty much fine now), it was plenty of fun, and I'm glad I got dragged along. 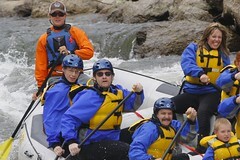 Ooh, I miss rafting! I'd like to go again. I'm glad to hear you're feeling better. Reading back in here is kinda ouch, I can't imagine going through it. Will you be at the picnic Wednesday? I'm going. I know, めちゃ久しぶり. I have lots of news to share. Yeah, it was pretty fun. We'll have to try something a bit rougher someday.